It won’t be a quick trip through Isaiah. Every year I plan to finish this powerful book before Christmas but, once again, I’m stopped in my tracks by the simple, elegant beauty of its truth. We’re weighed down by our sin, Isaiah wrote, but there’s a simple solution. Repent. It doesn’t sound easy, does it? The idea of stripping away layers of sin causes us to pause and reconsider. We’re too comfortable with the window-dressing of wrongdoing, and we want to preserve our false dignity, wrap our pride a little closer. Laying our souls bare before God frightens us, and well it should, for the King of the Universe demands purity. Bare souls have none of it. Repentance, however, isn’t the dreadful soul-massacre we might expect. Instead, it’s the best gift of all. Read the words of God again and revel in their tenderness. How can we have this white-as-snow purity? How can our sins be washed away? Only the divine gift of God’s provision can accomplish such complete cleansing. Jesus, God’s own Son, shed His precious blood as payment for our sins. Later, Isaiah will tell us much more about this Suffering Servant Son of God but today he merely whets our appetite. Centuries of animal sacrifices paid the acute price, but the massive guilt of our wrongdoing demanded a permanent payment. Animal sacrifice alone was not enough. We instinctively know our sin is too heavy a load to carry. What we don’t quite understand is how to rid ourselves of it. The costly gift of redemption is rarely celebrated in our traditional American holiday, but redemption is the point. God didn’t send His Son so we could buy meaningless gifts no one really needs and stack them under a fake tree as a monument to commercialism. 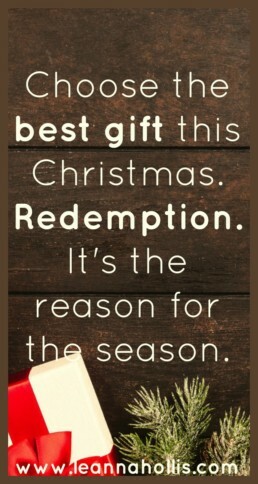 God sent His Son so we could be redeemed. Sin is the problem. Redemption is the solution. It’s also the point, the best gift of Christmas. Today, let’s remember one important truth. The only gift that matters, the only one with eternal significance, is Jesus. Only Jesus. What steps do you take to keep Christ in Christmas? I’d love to hear from you, so please comment below, and thanks for commenting. This was so so beautiful and such a breath of fresh air and powerful truth to be reminded of this morning. Thank you, sister! So often it becomes all about the gifts at Christmas, Leanna and then we forget the best gift of all–Jesus! Thanks for this important reminder to keep Him our priority in all we do and say this season and beyond! Thank you, Beth. I’ve spent far too many years focused on His hand instead of His face, the gifts instead of the Giver. You’re right. It’s too easy to forget Jesus is the best gift. Bless you, sister.